Important! Please leave a contact number because email sometimes goes to spam. 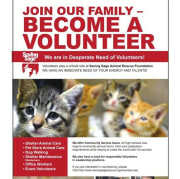 We are in need of regular and reliable volunteers to help socialize, care for and clear for our shelter cats and dogs. Come alone or in a group! Come join our shelter family. About two hours per visit is average.